Outside a desert town in West Texas and just a few miles from Highway 90 in the Presidio County, people from all over the world gather every night to catch sight of a rare and mysterious phenomenon. This has been going on for generations near the quiet town of Marfa. This mysterious phenomenon has confused and mystified visitors for ages with scientists and researchers still unable to give a concrete answer as to why the Marfa Lights appear. How Are The Marfa Lights Described? Eye-witnesses have described the Marfa Lights as strange lights which can hover in the air while appearing otherworldly or extraterrestrial. Some folks find the lights fascinating, and some feel that the lights are friendly, while others think the opposite. The lights have also been known to change directions, color and can vanish without warning. Many have tried to find the answers that would explain the Marfa Lights, but none have been successful, yet at least. The lights are said to be the size of basketballs and come in various colors including blue, red and yellow to name a few. They can also merge, split into two, hover, flicker or dart across the Mitchell Flat. For reference, Mitchell Flat is an area that is east of the town of Marfa and is where the lights are most commonly reported. They have also appeared in various weather conditions with no seemingly visible pattern to their appearance. Unfortunately, if you visit to see the Marfa Lights, you have to be lucky to witness the spectacle because these lights only seem to appear for around a dozen nights in a year. This phenomenon was first mentioned in 1883 by cowhand Robert Reed Ellison who saw the flickering lights on one evening and thought them to be a campfire of the Apache tribesmen. The locals later told him that they too had seen the lights but were unable to find any signs of campfire being present. In the Second World War, pilots from the Midland Army Air Field investigated the mysterious phenomenon but came back empty-handed. Headlights Or A Fata Morgana Responsible For The Marfa Lights? There are some speculations about the origins of the Marfa Lights that range from hot air interactions with the ground to UFOs and aliens. Some have even stated that the lights could be the wandering ghosts of the Spanish conquistadors. However, one of the more scientific theories to the existence of the Marfa Lights was given by a group of physics students from the University of Texas which reported that some of the sightings could be linked to headlights from cars on the US Highway 67 nearby. Another supposed explanation is a superior mirage which is caused by the refraction of light between layers of air that have varying temperatures. This is said to occur when a layer of warm air rests above a layer of cooler air. 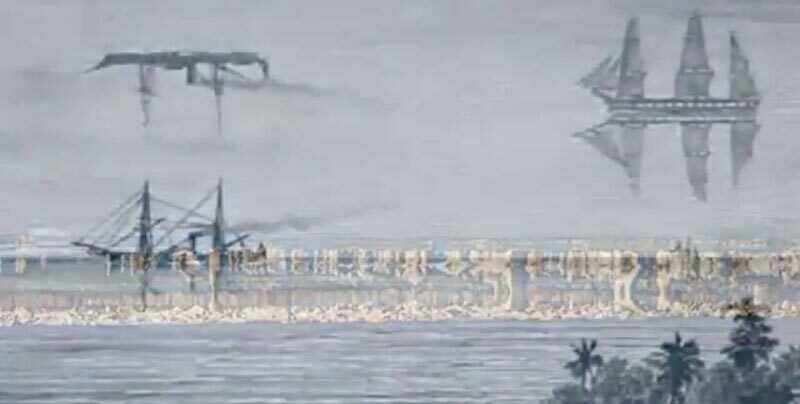 This optical illusion is also called a Fata Morgana which is also why sometimes ships appear to be floating above the horizon at sea. Exploding Swamp Gas Causing Glowing Marfa Lights? The theories of how the Marfa Lights occur has had many scientists obsessed over the lights with some of them stating that the lights could be the result of swamp gas igniting in the air. Swamp gas is said to contain Phosphine and Methane that can combust in oxygen under some conditions. The swamp gas ignitions are also called “will-o’-the-wisp,” “fool’s fire,” or “ignes fatui” with reports of this phenomenon occurring around the world in marshy lands. While the Marfa Lights don’t appear over marshy land, some people speculate that the reserves of natural gas and oil in the area could also contain pockets of Methane and Phosphine which become Marfa Lights when they ignite above ground. 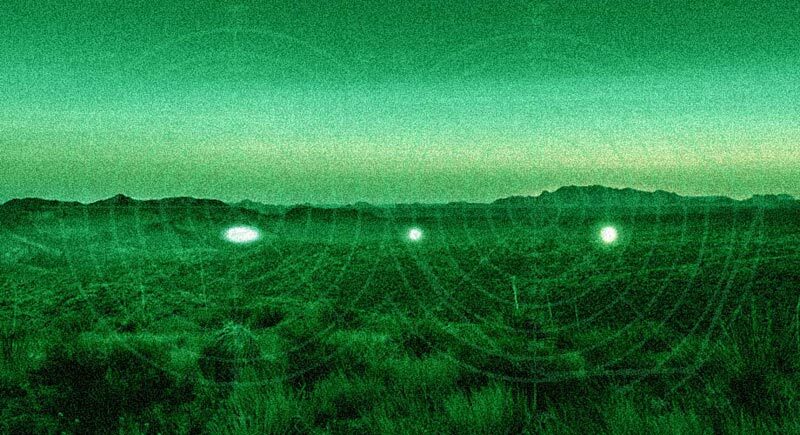 While these are just a few of the speculations and possible explanations for the Marfa Lights, it’s clear that those who have tried to find the origins of these mysterious lights have all failed. Fortunately, if you are interested, there is a viewing point for the Marfa Lights which can give you a front seat at finding out the origins of these mysterious lights yourself.